Well, that didn’t take long. Yesterday’s tease from Blizzard about something new coming to Hearthstone has already been unveiled. And, as the masses predicted, we’re going to see alternate heroes for the current classes. Whether or not you’ll get to do more than just see them—like actually play as them—is between you and your wallet, as the new heroes will only be unlockable through a real money transaction. 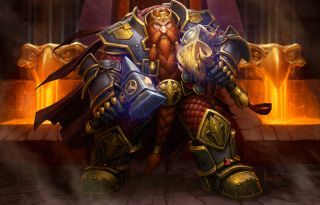 Magni Bronzebeard, the king of the Ironforge dwarves in Warcraft lore, is the first new hero to be revealed and will cost $10/£7, allowing you to use him as an alternate hero for the Warrior class. To be perfectly clear, purchasing and using Magni instead of the regular Warrior hero, Garrosh Hellscream, will have absolutely no effect on gameplay, only making cosmetic changes—similar in practice and pricing to skins in MOBAs like League of Legends or Dota 2. Magni will have an animated hero portrait, change the look of a small area of the board around him, have unique emotes, a new animation for his hero power—though the hero power’s effect is the same—and also comes with a unique card back. It’s also worth noting the language Blizzard has used in their announcement doesn’t explicitly state that every class will be getting an alternate hero, and leaves the door open for a class to have more than two options, saying Magni is “the first new Warrior Hero for Hearthstone.” There’s no word on when Magni will be available to purchase, only that he is “coming soon,” but it has been confirmed that Blizzard won’t be waiting until they have nine new heroes.